Was up till 4 am this morning on my PlayStation 3 checking out the new Skyrim update. Had to delete the game data and reinstall the game as the latest patch seemed to cause the game to freeze and hanged the system whenever the character entered water. After the reinstallation, my quests went pretty well.... lol. And as usual before I know it, it was 4 am. Well that was why I got up late. Now back to the Dr Who sonic screw driver. 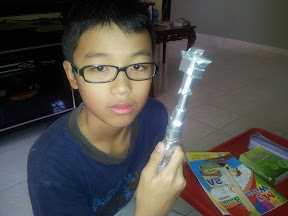 When I came downstairs, Joel was excitedly telling me that he made a sonic screw driver. I must say that it looked pretty good considering the fact that it was made from paper and cellophane tapes. I decided to spray it with silver paint to give it a metallic look. Joel, Jordan and Jodene have been Dr Who fans for the longest time. I introduced them the show a couple of years back. I myself have been a fan since I was a teenager when I watched a couple of episodes on the television broadcasted by the Brunei TV station. I used to stay in Miri, Sarawak, where we could received their broadcast; and then continued with the series on PBS when I studied in Canada. Anyway, I interviewed Joel in the following video. I am actually looking forward to see what my kids will come up with next. Maybe I will give them some additional art and craft items to see what they will fabricate... lol.